For the first time the cult favorite series is together at last! From the next generation of characters that have made Bluewater famous comes the most infamous of them all. Take youthful energy. Add in some over-active imagination. Mix in some powdered donuts. 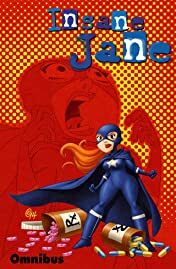 Sprinkle it with delusional disorder and you get... Insane Jane, The kookiest action hero of the 21st century! Will Jane save the day? Will Jane destroy the world? Will she remember to take her medication? Also included is the 10th Muse full issue featuring a cover by Roger Cruz that was the inspirtaion for the series. Over 200 pages of crazy!